Dr. Curran says this experience illustrates the need to examine patients in person and the value of an established patient-physician relationship. “Physicians can’t rely on the telephone or the Internet in every situation,” he said. 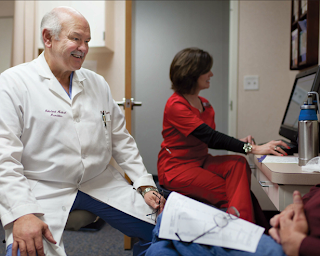 Like other physicians, Dr. Curran believes a doctor’s relationship with a patient is a sacred connection that fosters trust. Evolving technology, however, challenges doctors to communicate and consult with patients electronically without fragmenting the relationship or compromising patient safety. The emerging practice of telemedicine allows physicians to consult with patients over the telephone, through live Internet chats, with a webcam, or by other electronic means. Dr. Curran says telemedicine can be a valuable tool, especially for patients living in rural and underserved parts of Texas like Athens. It can be particularly effective in consulting with specialists, he says. One of his medical partners’ patients came into the emergency department. The disoriented man, who’d recently had surgery to remove a benign brain tumor, had been in an automobile accident. Dr. Curran, who was working at the hospital at that time, ordered a computed tomography (CT) scan, which showed a swelling where the tumor had been removed. He called the patient’s neurosurgeon 60 miles away, and they both examined the CT scan using an electronic health record system. “Working together, we decided to start the patient on medication and admit him to the hospital. Using technology, we were able to avoid transferring the patient, saving the system a great deal of money and ensuring quality, safe care. That’s telemedicine at its best,” Dr. Curran said.